Alfalfa honey, also known as lucerne honey is a variety of honey made from the nectar and pollen of Medicago sativa flowers. The alfalfa plant is a legume, related to beans and peas, and is primarily used as a high-protein feed for livestock. The honey obtained from its flowers is a sought-after variety with impressive health benefits. It boasts a probiotic action, antiseptic and antibacterial properties, anti-acne benefits, helps maintain normal blood sugar levels, manage hypoglycemia and is a great natural remedy for skin problems, cough and sore throat. Despite being used primarily as a source of food for domestic animals, the species can be employed for human consumption as well. Alfalfa seed sprouts and alfalfa honey are exclusively destined for human consumption. The sprouts are quite a generous source of essential nutrients such as calcium, iron, magnesium, phosphorus, potassium, zinc, vitamins K, C and folate as well as vitamins B1, B2, B3 and B5, carotenoid antioxidants and chlorophyll. Moreover, research shows the species is a source of vitamins D2 and D3 (The isolation and identification of vitamin D2 and vitamin D3 from Medicago sativa (alfalfa plant), Archives of Biochemistry and Biophysics). Alfalfa honey is a nutritious food and a wonderful natural solution to a variety of health problems ranging from skin issues to digestive problems and respiratory infections. What does alfalfa honey look like? This particular variety of honey has a clear, light amber color, but when crystallized turns slightly beige and opaque. Compared to the average crystallization time of most honey types, it is rather quick to solidify and form crystals. Why does alfalfa honey crystallize faster? Because of its higher glucose content. Honey types with a higher content of fructose (example: acacia honey) crystallize slower, but storage conditions may also play a part in determining how fast or slow a honey crystallizes. However, just because it crystallizes, that doesn’t mean it goes bad. It just becomes more solid and slightly more difficult to spread on bread. What does alfalfa honey taste and smell like? Overall, alfalfa honey is not very sweet and doesn’t have a very intense flavor either. The variety has a delicate, mildly sweet taste and an undistinctive, basic honey smell. If not processed and not filtered, it may retain faint grassy, herbal or spicy flavor notes and a barely perceptible floral aroma. Because it doesn’t really have an intense flavor profile, it is a preferred cooking honey. However, it’s still honey and it still contains a lot of sugar, albeit natural forms, and heating it will result in the formation of potentially carcinogenic secondary metabolites. 1) Antiseptic and antibacterial properties. Like all honeys, alfalfa too contains varying amounts of a natural antimicrobial known as hydrogen peroxide. Hydrogen peroxide forms as a result of the interaction between the sugar glucose and an enzyme from honey bees called glucose oxidase. Moreover, honey is acidic and bacteria don’t do well in acidic environments, hence another reason it is a natural antibacterial. Lastly, its low moisture content and density act like a barrier, preventing bacterial growth. Antiseptic means the honey inhibits the growth of bacteria, while antibacterial means it both inhibits growth and destroys pathogenic bacteria. Uses: Currently, honey-based wound dressings are being developed. The reason behind the efficacy of these dressings lies in the natural antiseptic and antibacterial properties of honey which contributes both to inhibiting bacterial growth and promotes faster wound healing. Moreover, taking honey in herbal infusions or by its own can help improve the symptoms and evolution of colds, flu and other respiratory tract infections. Honey not only limits bacteria spread and reduces bacterial load, but also forms a protective layer over the throat lining, allowing it to regenerate and heal, which helps with discomfort. 2) Soothing effect. Its density and composition enables alfalfa honey to form a protective layer over inflammed mucous membranes it comes into contact with. This allows them to heal and regenerate, helping improve various conditions. Uses: The honey is a natural remedy that helps relieve cough and soothes throat irritation. If I spend a day outside and it’s cold and windy or I have a sore throat, I like to take one tablespoon of raw honey a few times a day to calm the irritation. I prefer raw honey and I always avoid heating it because it can result in the formation of dangerous metabolites. Also, I avoid eating or drinking anything for up to an hour afterwards. If I sweeten my tea with honey, I always wait until it’s room temperature or lukewarm until I add the honey. This is because heat alters the composition of honey and destroys its beneficial compounds. Lastly, alfalfa honey can help soothe an irritated stomach lining and may thus be useful for gastritis. 3) Natural prebiotic action. In vitro research suggests alfalfa honey can encourage the growth of several beneficial gut bacteria, including Bifidobacterium bifidum, Bifidobacterium infantis, Bifidobacterium breve, Bifidobacterium longum and Bifidobacterium adolescentis (Carbohydrate composition of honey from different floral sources and their influence on growth of selected intestinal bacteria). In other words, it has a natural prebiotic effect, nourishing the good bacteria in our digestive tract and thus promoting digestive health. Not to be confused: it is not a probiotic like yogurt because it does not contain beneficial live bacteria, but feeds the ones we already have. 4) Wonderful skin mask. In my experience, light-colored honey varieties like alfalfa or acacia are great for uneven skin tone and have a brightening effect. Moreover, they give skin a natural glow and combat dullness. Honey face masks also help unclog pores and have a mild astringent effect. I also find they can help prevent acne breakouts if used consistently. I apply the raw, unheated honey on a clean face, let it sit for about 20 minutes, then wash with lukewarm water. 5) Energizing effect and nutritious. The variety has a unique composition, rich in natural enzymes, vitamins, minerals, carbohydrates and other elements with a variety of benefits that indirectly contribute to our good health. 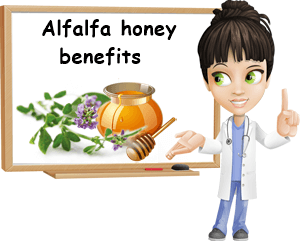 Alfalfa honey contributes to preventing hypoglycemia and improving appetite, but fades in comparison to vitamin C in this respect (vitamin C is the ultimate remedy for poor appetite). It’s also a good substitute for refined sugar and artificial sweeteners, although remember it is never good to heat honey. While it won’t have an immediate negative impact on our health, such habits are insidious, their side effects showing over time. 6) Source of antioxidants. Alfalfa honey contains a variety of antioxidant compounds, notably flavonoids. Antioxidants protect cells against free radical damage called oxidative stress. It has been shown that oxidative stress can interfere with normal cell functions and cause damage and inflammation that may encourage the development of chronic diseases over time. One of my favorite ways to enjoy alfalfa honey is drizzling a tablespoon of it over a 100 g serving of plain yogurt. I find the contrast between the mild sweetness of the honey and the acidity and slight sourness of the yogurt delicious and refreshing. 7) May have a diuretic and detoxifying effect. It is important to clarify what detoxifying really is. It’s not like one food will magically take over our body functions and set to clean our system of toxins accumulated as a result of years of poor dietary and lifestyle choices. It doesn’t work like that. But choosing the right foods, that are as close as possible to their natural state (ex: unprocessed) can make it easy on our body to work optimally, which allows it to perform all the functions its supposed to, including detoxification. To cleanse our body of toxins we need one healthy liver and two healthy kidneys, our job being to support their function by eating clean and living right. And alfalfa honey is a good option in this respect. Alfalfa honey and allergic reactions. Everything that has pollen is a potential source of allergens for people with an overactive immune system that perceive even neutral elements such as pollen as threatening pathogens. Honeys in general contain pollen to a certain extent. The amount contained determines the allergenic potential of a certain variety. For example, acacia honey should contain around 15% pollen, making it less allergenic that other varieties. However, if you are allergic to the pollen of a certain plant, be it acacia, alfalfa, cherry blossoms or orange blossoms, or of multiple plants, to honey in general or specific elements found in it such as resins, enzymes or propolis, then it might be best to avoid consumption. If you only suspect an allergy, it might be best to have a skin allergy test before to confirm or rule out a honey allergy.